Porsche's 191 U.S. dealers will invest a combined $70 million in building out a retailer-based network of fast chargers to support the automaker's first battery-electric vehicle, the Taycan. The investment is part of a nationwide charging infrastructure plan Porsche Cars North America announced Monday. The Volkswagen Group-owned automaker expects to have a network of more than 700 high-speed chargers in time for the Taycan's U.S. arrival late this year. Taycan customers will receive three years of unlimited 30-minute charging at Electrify America locations, Porsche said. Automotive News foreshadowed the Porsche-Electrify America tie-up in October. Volkswagen-backed Electrify America will pour $2 billion over the next decade into developing a coast-to-coast network of fast chargers accessible to all brands. 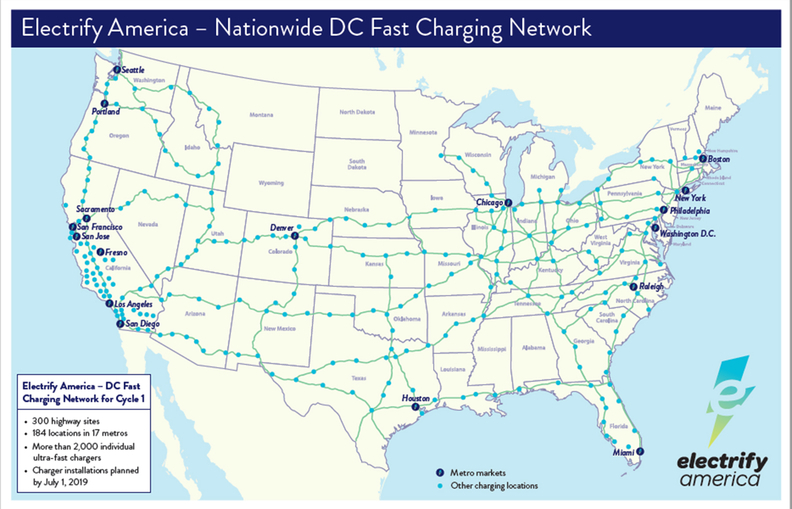 In its first investment phase, Electrify America will deploy about 480 direct-current fast charger sites in 17 urban areas and along highways by mid-2019. So far, 89 sites have opened. Porsche is following the lead of Volkswagen stablemate Audi, which will provide customers of its e-tron EV with 1,000 kilowatt-hours of charging at Electrify America sites over four years. Porsche also said it will offer a home-based charging system, but did not provide details. "Together, Electrify America and our Porsche dealer network will provide a national infrastructure for DC fast charging that frees future Taycan owners from range anxiety," Porsche Cars North America CEO Klaus Zellmer said in a statement. "And, Porsche home charging technology will turn the customer's garage into the equivalent of a personal gas station." The Taycan is at the vanguard of a wave of electrified Porsche vehicles. "We expect by 2025, roughly 50 percent of our products to be electrified, either with a fully electric engine or with a plug-in hybrid," Porsche sales chief Detlev von Platen told Automotive News. Powered by two synchronous motors that generate more than 600 hp, the Taycan can go from 0 to 60 mph in less than 3.5 seconds. The vehicle will have a range of 310 miles. 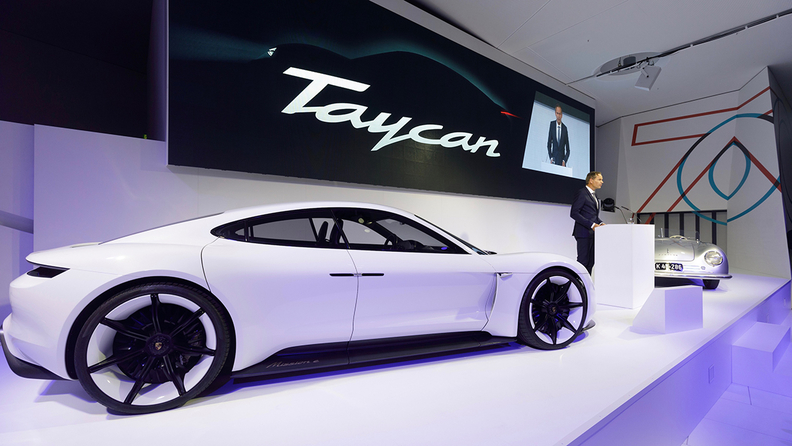 Demand for Taycan is so brisk that Porsche has doubled planned production to 40,000 vehicles, according to Automobilwoche, an affiliate of Automotive News. That would make Taycan more successful than the iconic 911 sports car, which sold nearly 36,000 last year. “We have more than 200 pre-orders for the Taycan, and it’s 11 months away, Robert DiStanislao, member of the Porsche Dealer Board of Regents, told Automotive News late last year. The EV will be presented at the Frankfurt auto show in September. Pricing has not been announced, although Porsche is expected to position the Taycan below the brand's Panamera sedan and above the Cayenne crossover, with a likely starting price above 80,000 euros (about $91,000). Using 800-volt technology and the combined charging system, or CCS, plug, the Taycan will be able to add more than 60 miles of range in four minutes. Electrify America's highway stations will have a minimum of two 350-kilowatt chargers per site, with additional chargers delivering up to 150 kilowatts. Ironically, on Jan. 25 Electrify America said it was shutting down the majority of its 150 kilowatt-350 kilowatt chargers to investigate a potential safety issue with its liquid-cooled cables. More than 120 Porsche U.S. dealerships will offer 320-kilowatt chargers. The remaining dealerships will install 50-kilowatt fast chargers. The charger investment will cost retailers between $300,000 and $400,000 per store on average, Automotive News first reported in October. The cost of the charger investment will be painful for some lower-volume dealers, Todd Blue, CEO of IndiGO Auto Group, told Automotive News at the time. "The industry is changing and we all have to get ready for the future," Blue said. "There is no mistaking the future will have a significant component of electric by 2025."